The recent floods here in southern Alberta provided a sobering reminder of how important it is to think about incorporating overland flooding prevention strategies into your new build should you be in located in an area where flooding is likely. A wide range of effective techniques can be used to redirect floodwaters away from your home, and prevent them from penetrating your home’s interior if water levels rise. Examples include specialized landscaping and lot grading features, window wells and water-resistant windows, eavestroughs and downspouts. Properly implemented, these features go a long way towards protecting your home’s interior from the devastating and difficult-to-repair damage flooding can cause. Lot grading is the creation of a slope to divert large volumes of water away from your home. A comprehensive approach to lot grading includes a plot or grade plan, along with swale drainage. Swales are shallow concavities that force surface runoff away from your home. They are typically located around the perimeter of your property and should drain into a street, lane, alleyway or storm management reservoir. If you are experiencing drainage problems and water damage in your current home, lot re-grading may be an option. Remember that many Alberta municipalities require a specialized permit known as a Lot Grading Certificate to ensure your project conforms to codified standards. A registered Alberta land surveyor can perform an inspection of your property and prepare a Lot Grading Certificate on your behalf. For readers in Calgary, the City of Calgary offers a detailed explanation of its lot grading guidelines on its website. Calgary’s Fine Line home builders also emphasize that you need to prioritize drainage considerations when you’re designing your landscaping features. Do not add landscaping features that interfere with your swales, and do not place flowerbeds too close to your foundation, as it’s possible to saturate your foundation’s drainage capabilities by watering your plants. Finally, make sure flowerbed slopes are directed away from exterior walls. Window wells play an essential role in drainage, and should always be incorporated into a home’s design. Though window wells are typically found around basement windows, they can also be added to windows on your main floor and even your upper floor. If your home doesn’t have them, or if they are not properly maintained, water can drain directly into your home, causing major damage and humidity problems. A well-designed window well will have a steeper slope than your lot grading. You should always make sure that your window wells are not encumbered by debris such as dirt or leaves, as these will interfere with proper drainage. Custom home builders in Calgary also emphasize the need to add floodwater-resisting capabilities to your windows and exterior doors. As part of a comprehensive flood resistance plan, you need to make sure that any cracks and gaps around your windows and doors are properly sealed. While this won’t generally be an issue in a newly built home, you should perform an annual inspection just to be on the safe side, no matter how old your home may be. Some of the other measures you can implement to improve your windows and exterior doors include replacing seals around windows and door frames and treating window frames and door frames with water-resistant sealants. 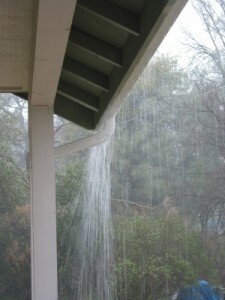 These essential structures divert rainwater striking your roof safely away from your home. Ideally, your downspouts should drain into the swales around your property. If this requires the use of downspout extensions, make sure to leave the extensions in place throughout the year, as there’s no telling when we could get hit with a major storm. Even during the winter, a Chinook could bring unseasonably warm temperatures and heavy rains. You should inspect your eavestroughs at least twice a year – in the spring and in the fall – to make sure they are not clogged. Leaves and other debris can inhibit the efficient flow of water through your eaves to your downspouts, and that water could end up leaking through your roof. Questions? Contact the Leading Calgary Custom Home Builders! Fine Line Homes is Calgary’s leading builder of beautiful, energy-efficient Calgary homes. Prioritizing sustainable building practices, Fine Line Homes creates stunning homes that we customize according to your unique specifications. Our architectural and engineering teams work closely with you to ensure your new home not only meets your lifestyle needs, but also incorporates proven damage prevention practices. You can learn more on our blog, or by contacting a Fine Line Homes customer service representative.